Present Eysenck's Personality Types Theory in a circular diagram. 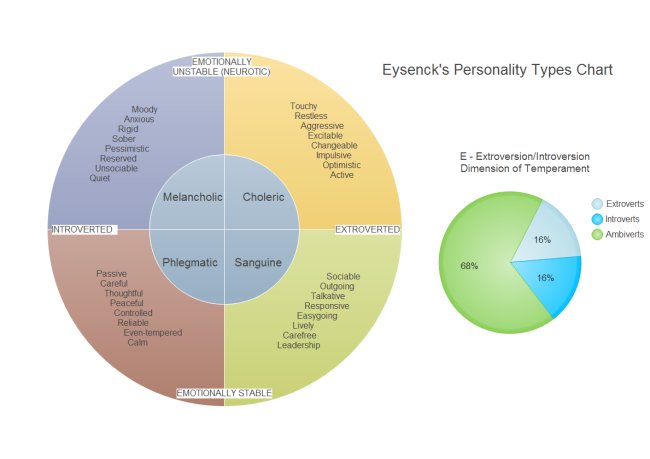 Help you better understand the Eysenck's Personality Types Theory. Hans Eysenck was born in Berlin, Germany on March 4, 1916. In 1940 he received his Ph.D in psychology from the University of London. Eysenck worked as a Professor of Psychology at the Institute of Psychiatry, King's College, London, from 1955 to 1983. He was a major contributor to the modern scientific theory of personality. The two personality dimensions, extraversion and neuroticism, were described in his 1947 book Dimensions of Personality. It is common practice in personality psychology to refer to the dimensions by the first letters, E and N.
According to Hans Eysenck, personality is the sum-total of the actual or potential behavior-patterns of the organism, as determined by heredity and environment. It originates and develops through the functional interaction of the four main sectors into which these behavior-patterns are organized". In other words, personality is one's whole character and nature. Simply speaking, it is what makes who you are and what makes what you do. Eysenck initially conceptualized personality as two, biologically-based categories of temperament: Extraversion/Introversion and Neuroticism/Stability. The two dimensions or axes, extraversion-introversion and emotional stability-instability, define four quadrants. High N and high E = Choleric type (unstable extraverts) : qualities such as - touchy, restless, excitable, changeable, impulsive, irresponsible. High N and low E = Melancholic type (unstable introverts): qualities such as - quiet, reserved, pessimistic, sober, rigid, anxious, moody. Low N and high E = Sanguine type (stable extraverts): qualities such as - outgoing, talkative, responsive, easygoing, lively, carefree, leadership). Low N and low E = Phlegmatic type (stable introverts): qualities such as - calm, even-tempered, reliable, controlled, peaceful, thoughtful, careful, passive. This diagram is characterized by vector smart shapes with floating quick buttons. It is editable and printable. You can transfer it into many other formats including PowerPoint, PDF and JPG. By applying another theme, its appearance changes at one click. Jeffrey Alan Gray, a former student of Eysenck's, developed a comprehensive alternative theoretical interpretation (called Gray's biopsychological theory of personality) of the biological and psychological data studied by Eysenck - leaning more heavily on animal and learning models. Currently, the most widely used model of personality is Big Five model (Costa & McCrae, 1985). Refer to article: Big Five Personality Dimensions for more information.